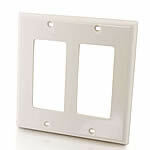 This Decora®-compatible wall plate dresses up any home theater, conference room or classroom, and provides the final finishing touch to your audio/video installation. 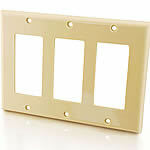 Unlike traditional passhrough wall plates, it is constructed by using four-layer computer grade printed circuit boards (PCBs).The PCB traces are engineered to maintain the critical impedance necessary to transfer the delicate digital signal. Made from 20 AWG steel, this strong wall plate fits standard electrical boxes, and is compatible with Leviton Decora® brand trim plates. 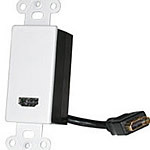 Use this wall plate for your HDMI installation. The PCB traces are engineered to maintain the critical impedance necessary to transfer the delicate digital signal. 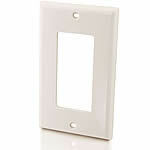 Made from 20 AWG steel, this strong wall plate fits standard electrical boxes, and is compatible with Leviton Decora® brand trim plates. 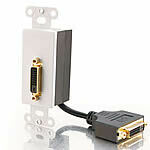 Use this wall plate for your DVI installation.